It's been raining almost all week. Today we finally got a bit of a break. It's been misting on and off. 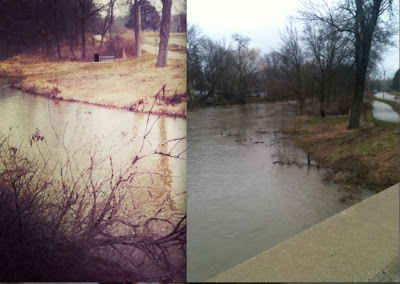 The river by my house is starting to creep into the back yards of the houses around it. All we need is a day or two of no precipitation! The picture on the left is from two weeks ago and the picture on the right is from today. 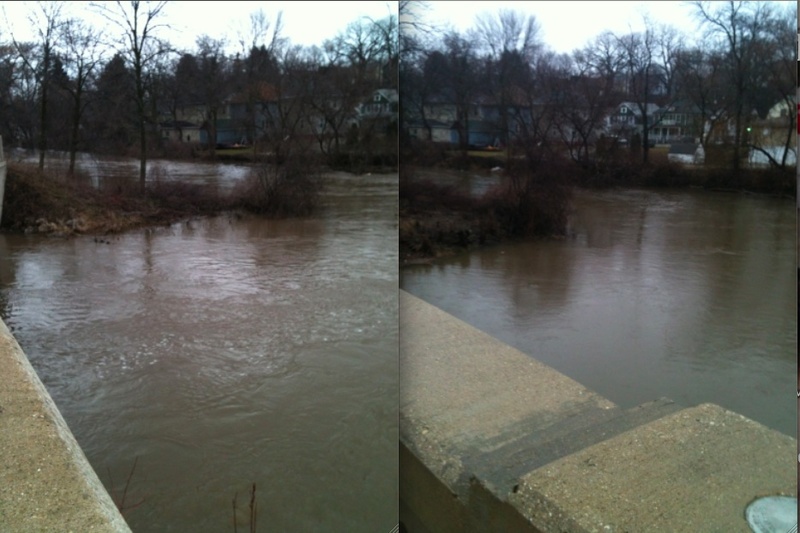 The picture below on the left is from today and the right is from two days ago! I tried getting the same angle so you could see the difference. I walked down the path a bit to check out the other houses along the river. 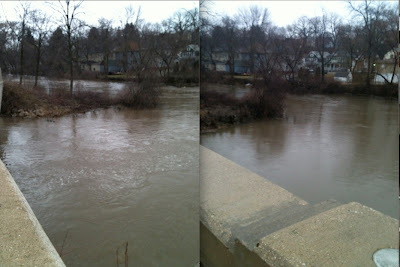 I just hope the water recedes quickly! On another note, I had a four mile run to get in. It was a bit chilly from the wind and the on and off again misting. I decided to wear my leg warmers to add a little extra warmth. I made them for the Halloween Hustle where I dressed up as a 80's/90's girl. I still use them pretty frequently when I run. They really keep me warm! I keep forgetting to make another pair. The first two miles seemed to take forever! My shins and calves were feeling pretty tight as well. The last two miles were better, but we ended up a bit far from home so we ran .3 more to get closer. Our splits were pretty consistent as well. We have been running at almost the same pace every time. We always seem to average about a 11:30 and that feels pretty comfortable. 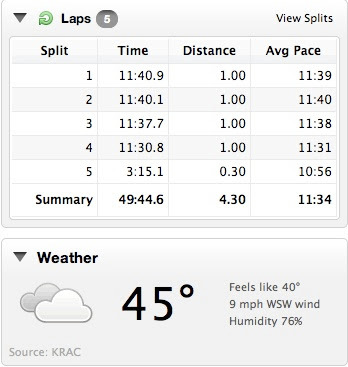 I hope the weather clears up a bit for my long run on Sunday!